I am having an issue with haplotypecaller omitting true heterozygotes. Attached is an IGV image of the VCF (top track), de novo reassembled BAM file (middle) and input BAM file (bottom). This appears to be happening all over. I was wondering what I can do to address this issue. p.s. I get the same results when running without multiple threads and when outputting the rearranged BAM file used for variant calling. It does seem like Haplotype Caller is throwing out most of the reads. I am assuming it is due to filtering. Are any of the reads duplicate in the region? Can you post the VCF record for the position? Also, can you confirm the mapping qualities and base qualities are good at the position? The first 17 reads from the rearranged BAM file (middle track) have BQ = 33 and MQ = 60, the bottom 3 have lower BQ (~18) but still have MQ 60. I am confused as why DP = 3 at this position, even though there are obviously more reads that support the alternate allele and have MQ = 60. Adding those arguments has solved my problem. Thank you for the help Sheila. Can address why 80% of the reads are not considered in the genotyping? I have 19 reads at this site and the VCF file only reports 3. This is a bit of a concern. With the two extra arguments, does Haplotype Caller still throw out 80% of the reads? Yes, even though the mapping qualities are very good (50-60) and BQ > 15, the reads are still thrown out. In some cases, the SNP is called heterozygous even though 0 reads are an alternate allele, in both the reduced read set as well as the original BAM file. In other cases I am seeing the arithmetic completely off, such as a site that has AD 5,10. But I am only counting 15 alternate alleles in the BAM file..
Did you follow the Best Practices workflow for the pre-processing steps? What version of GATK are you using? yes I followed all the Best Practices and I am using version 3.4-0. When I use another variant/genotype caller with the same input BAM file, I do not have this issue. Okay. Can you color the bamout file by sample? 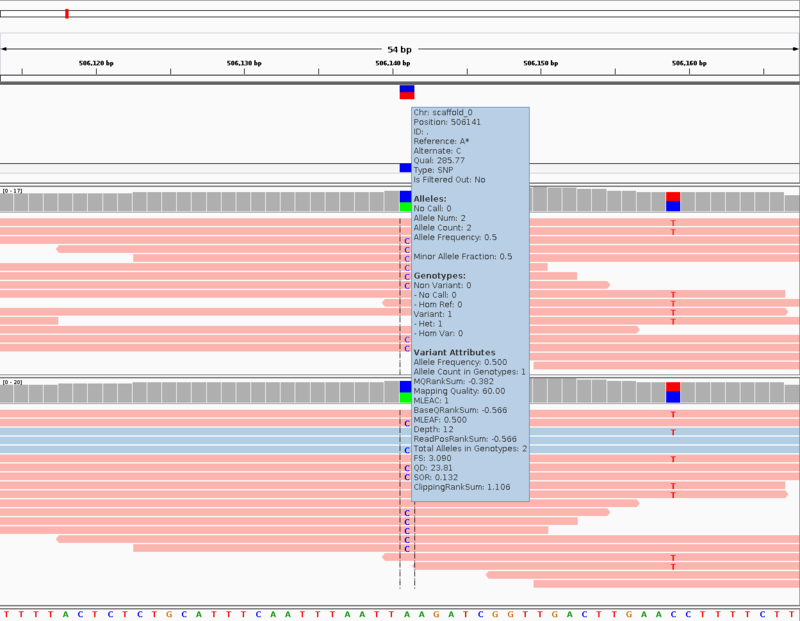 (Right click on read -> Color Alignments By -> Sample) Some of the reads in the bamout are the artificial haplotypes constructed by HaplotypeCaller. Please post the colored by sample bamout file here. In this example, two reads are still unaccounted for. Just wondering where they went? I gave you the rearranged bam file on accident. I have uploaded another tar zipped folder named missingreads_snippet-0-2.tar.gz to the ftp server. Sorry for the confusion. Any update as to why perfectly good reads are being tossed by HaplotypeCaller? Sorry I have not gotten to this yet. I will get back to you soon. Can you please upload the reference you are using? Unfortunately, when I run Haplotype Caller on your snippet.bam, I do not get any variants. Perhaps you provided too small a bam file? I am about to view the bam in IGV, but please make sure the issue reproduces before submitting the bam. 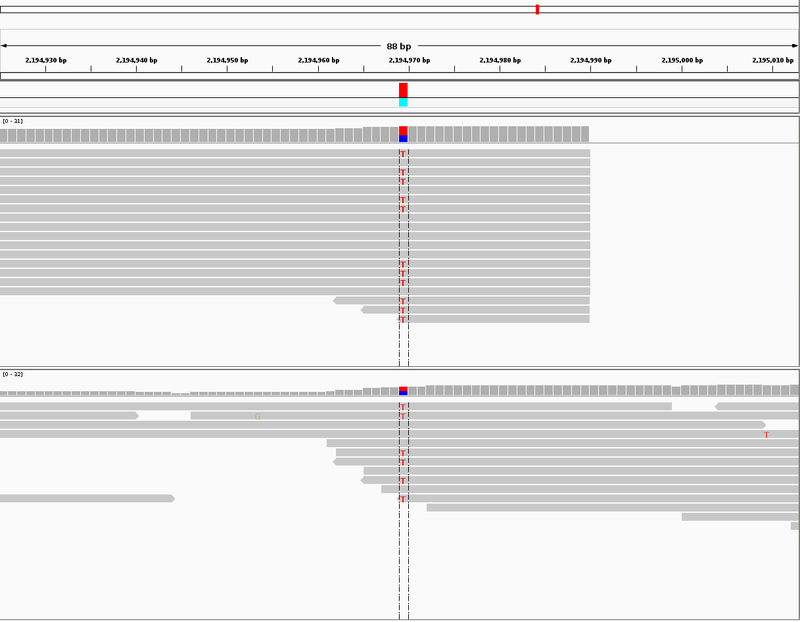 I did not get any variants using Haplotype Caller in normal mode or in GVCF mode. I apologize for the misuse of your time. Thank you for helping resolve this issue. I am assuming you are concerned about position 506141? There is no difference in read depth when I run Haplotype Caller. I ran the same command as you with a smaller interval (505000-507000) and -nt 1. The original bam file has 14 reads as does the bamout file. There must be a discrepancy some where? I just reran with -L scaffold_0:505000-507000 -nt 1 to my command line, I still have 12 reads at that position in VCF. I am using GATK v 3.4-0. I apologize if it seems like I am wasting your time, but I would really like to figure out what I am doing that yields discordant results. Hmm. I just tried with 3.4 and got my original results. When looking at both the original bam file and bamout file, I get the matching results. I will spend more time with this and give an update if I figure it out. Thanks for everything! Sure. Please note, there are a lot of artificial haplotypes in the bamout. Maybe even more artificial haplotypes than real reads! That was one interesting thing that I did not delve into. I expect a lot of CNVs and paralogous sequences in my alignment, which could explain the increased number of artificial haplotypes. The reference I am using is a de novo assembly as well. But it is something else for me to look into. I really appreciate your time, I know how valuable it is!